It's been almost a year since I've moved to Morocco and I definitely miss a lot of people/things/places from back home in America. One of the things I miss the most is my social circle and having a lot of friends. You see, here it's a little different. It's harder to make friends here and sometimes people are intimidated by me. There are a lot of people that are hesitant to speak with me because they either don't speak English or if they do, they're afraid it isn't "perfect" enough. The ironic part is that they don't know that I speak Darija Arabic just fine. But hey, that's life I guess. One day, about 3 months ago, Mohamed told me, "I know somebody that's married to a woman and she's an American like you. She's also Muslim and she lives in Agadir." I was like, "Wait, WHAT??!!!" How could this be true? There's an American chick here and I don't know her? Why not? We need to change that ASAP. About a month ago, after the Friday khotba in the mosque, Mohamed tells me over lunch that he has the number of the man who's married to her and he called him 5 minutes prior. He tells me, "She's excited to meet you and wants you to come over right away. Like now. Like right now." Ok! Sounds good to me! As soon as we finished the obligatory couscous, we headed out and went to their gorgeous apartment. Her husband told me she was just inside around the corner in the living room. Much to my surprise, their house looked totally American! There was no Moroccan tiles, no lace doilies on the tv, no fake flowers, and no paintings hung on the walls with their plastic and cardboard corners still on. Then Sarah, yeah that's right--SARah, not "Seddah" came down the hallway and introduced herself. Here's the best part: She spoke English! Yes! Real English! With sarcasm even! I was already sure we were gonna be good friends. After a few minutes I see this amazingly gorgeous little 4 year old girl. Her name is Hannah and she looks like a tiny version of M.I.A. She has big, beautiful bouncy curls and an irresistable smile with a little gap in her teeth. She is so stinkin' cute and I instantly fell in love. Just when I think she can get no cuter, she starts to speak English. She said, "Mama, the woman? She's here now." She said it with the most innocent whisper and I couldn't believe how cute she was. Then I met her brother. His name is Ibrahim (EE-bruh-HEEM) and he is too much for words. Picture an adorable little one-year old with white skin, blonde hair, and big brown eyes that just look up at you and melt your heart. Yeah, that's my dude. He's my little homey and he has the cutest 3 1/2 teeth you'd ever see. 2 babies on the bottom and a big one up-top. The fourth one is on its way in but you don't even notice it--because when he smiles you just see the Big Poppa up top. So as Sarah and I start talking, she notices my accent. I notice hers. 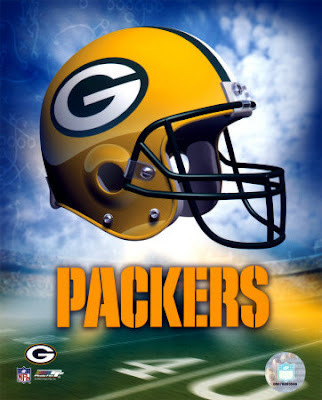 Hmmmm.... Later I say that I'm from Kenosha, Wisconsin originally and guess what? She's from Green Bay! What?! Are you kidding me? Seriously, what are the chances that 2 cheese-heads both converted to Islam, moved to Agadir, and love to cook? We were both like, "No waaaay! That's awesome!" What was that? Undefeated? Oh yeah. As it turns out, Sarah's supes cool and she has the same sense of humor as me. (big plus) We understand eachother in a way that's hard for Moroccans to understand us. Did that make sense? I bet she'll understand it when she reads it. Ha! No seriously, we really get along well and it's like a small piece of home is here with me now. I find comfort in our friendship and it's only just beginning. ﻿One day, we were talking about what we miss most about living in America. We both admit that (besides our family and friends of course) it's definitely the food. I was nearly drooling when I started talking about how much I miss the Taco Trucks in LA and how absolutely bomb Mexican food is. 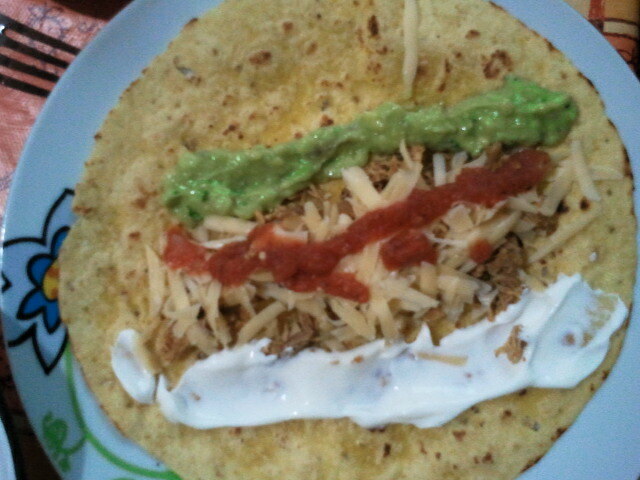 There's no sour cream here which eliminates a lot of cookng. But wait! Sarah informed me there IS in fact sour cream here. But like everything else, It's a Hoax . It's actually sour cream wearing a yogurt container's clothing. M-hmm. Not surprised. So guess what that little food angel friend of mine did? She invited me over a few days later for a Mexican Fiesta! 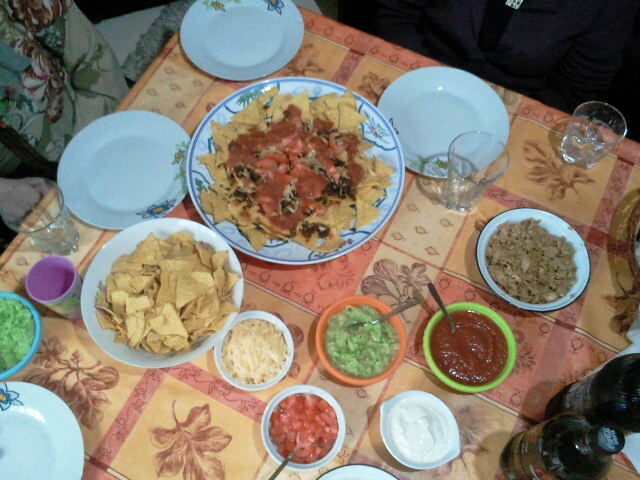 We're talkin' home-made guacamole, nachos, beef AND chicken, real tortillas, salsa, the whole nine. (or maybe the whole nueva) I'm not even joking, my mouth was watering as I was going up the elevator. The whole house smelled like guac and cilantro. Seriously, I walked in and it was like lunch ecstasy. So happy for you and Sarah! And I know lots of people who eat that perley stuff straight up and call it yogurt. I mean how could you NOT know it's NOT yogurt once you taste it??? I'm not sure what makes me happier to learn: that you have a new friend or that you're eating Mexican. So, I think you're like the coolest person I've read about in quite a while! :) As a fellow American convert married to Moroccan, I just wanna ask - How'd you learn darija? It's been 9 years for me and I still have a wayyy to go! wazzup wit dat? When did you convert? Also, where are you living now? One last thing: How did you come across my blog? I've just discovered your blog today, and what led me here is rihanna's song "where have you been" lawls. To my biggest suprise I gradually learned that you actually lived in morocco and that you where a muslim. That's some big sacrifice leaving the states isn't it. For this, I look up to you, respect. I'm sure the more digging you do on here, the more you'll find that maybe you can relate to. There's one called "It's a Hoax" that you might like. It's about how things here aren't always what they seem. I know a lot of my comments and post definitely ruffle a few feathers for some Moroccans, but I can assure you, I only make plain observations. I write about what I have personally seen with my own 2 eyes since I've been here.